YouTube connects creators like you with millions of viewers all over the world. It’s easier than ever to offer a multilingual experience on your channel and reach a worldwide audience. On average, two-thirds of a channel’s views come from outside the creator’s home country. Even if you’ve never considered building an international audience, your channel likely has a bulk of viewers who speak a different language or live in a country other than your own. Increasing the accessibility of your channel could lead to growth in watch time, reach, and engagement in new markets. YouTube has built-in tools to help you do this. You can add captions and translated titles, descriptions, and subtitles to your videos. And there are tools available to help you crowdsource translations. It’s easier than ever to set your channel up for new audiences from around the world. How do you know if your channel is ready for a worldwide audience? You can start off by checking your “Build an audience” tab in YouTube Analytics to see where your audience tunes in from. If you see a lot of watch time coming from countries whose residents speak languages other than your own and think your content would be interesting to them, try out YouTube’s suite of translation tools. If you don’t see a globally diverse audience in your demographics, keep reading--and also check out our lesson on content strategies that may have more international appeal. 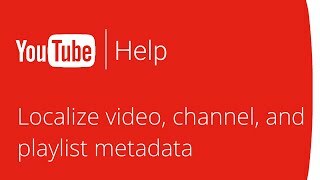 YouTube's Help Center offers instructions for adding localized titles and descriptions to videos and playlists. In this video, he encourages all creators to add closed captions and translated subtitles to their videos and asks his community for help with this task. Closed captions (cc) are written transcripts of a video in the language spoken that display visually on screen. They can increase your channel’s reach by giving viewers the option to read words instead of listen. This can be beneficial to audiences who are hard-of-hearing, are watching in a loud environment, or don't want to turn the sound on. They're easy to add to your channel. Auto-generated captions are also available in some languages and viewers can turn them on and off. Subtitles are translations of captions. They offer audiences who do not speak the same language as a video the option to read a translation of the words spoken. You can translate and write subtitles yourself or crowdsource them from your community by enabling “Community contributions”. These tools can help expand your channel’s reach--but they’re not a secret formula for overnight success. Try using insights from YouTube Analytics to make sustainable and strategic choices that can help your channel grow internationally over the long-term. Remember, once an international audience finds your channel, you’ll want to keep them coming back for more. While it’s ok to translate one-off videos, it can be more beneficial to translate an entire series. Also, consider whether or not audiences who speak another language might need subtitles to understand your video. Some video formats, like music, toy unboxings, or do-it-yourself, can be easily understood without subtitles. Whereas other types of videos, like vlogs or news, could benefit greatly from subtitles. After you’ve implemented translation tools on your channel, check back into YouTube Analytics to see how well your channel is performing in foreign markets and other languages. Try comparing the watch time from the original language of the video with all the translated languages. Also, check your Translations data. Expanding the reach of your audience globally lets you foster a diverse, international community on your channel and can, ultimately, help result in greater engagement and monetization opportunities.